A fundamental tenet of any asset-integrity strategy is to accurately measure metal loss so it can be properly managed. Sensor Networks’ smartPIMS provides that as a safe and cost-effect solution. Ultrasonic nondestructive testing (NDT) is a 70-year-old, proven, established and refined technology. Recent advances with microelectronics, software, wireless communications and the “internet of things” have made “installed ultrasound” an extremely attractive and cost-effective solution for corrosion & erosion monitoring. Safe. Non-invasive to the asset’s pressure boundary. Extremely accurate to 0.001” (0.025 mm), with ability to measure down to 0.040” (1 mm) in carbon steel, especially for fixed-location probes. Rugged, reliable and portable. Low recurring maintenance costs. 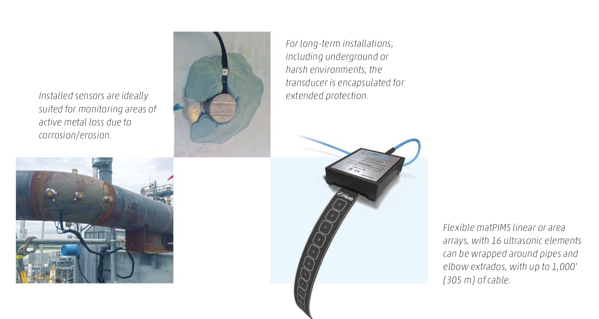 Remote wall-thickness monitoring for corrosion, erosion or cracking. Only system to combine cellular data with dual-element transducers. Each transmitter supports up to 8 dual-element, 16 single-element or 16 delay-line transducers. Sealed housing with long-life battery. Collect and transmit data on any periodic schedule. webPIMS can automatically or manually receive data from ultrasonic sensors for web-based display, storage, trending and analysis. Users can access this data from anywhere with an internet-enabled device such as a PC, tablet or smart phone. An intuitive user’s interface allows easy access to stored images or pdf drawings of the actual installed set-up. Temperature sensors at the TMLs record the asset’s temperature while software automatically compensates for thermal changes.